A few days back, one of our users asked for the best WhatsApp chat plugins for WordPress. If you are looking for the same, this post would be interesting for you! Lead generation can be done using pop-ups. You know that. Well, these days, you could use a WhatsApp plugin on your blog for generating leads, increasing sales! When you run a business website/ an online shop or if you need to get connected with your clients, WhatsApp messages are the simplest way! We all got a WhatsApp account. Most of us. If you are running a WordPress website and looking for the best WhatsApp chat plugins for WordPress, we have got your back! 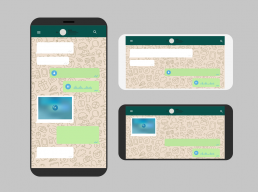 In this post, we are going to show you the top 8 WhatsApp chat plugins for WordPress which you need to get your hands on! For your businesses’ success, you need to generate leads. Simply think this. You are running an online shop where you will sell some physical products. When someone is interested in your item, probably he may want to contact you – for some friendly conversation regarding the product. When he gets to you, you could save his email address to your email list, promote your limited time discount coupons, blog posts and whatever you need. He will become a loyal customer. So, Generating leads is no more optional! Why Use WhatsApp Chat Plugins? 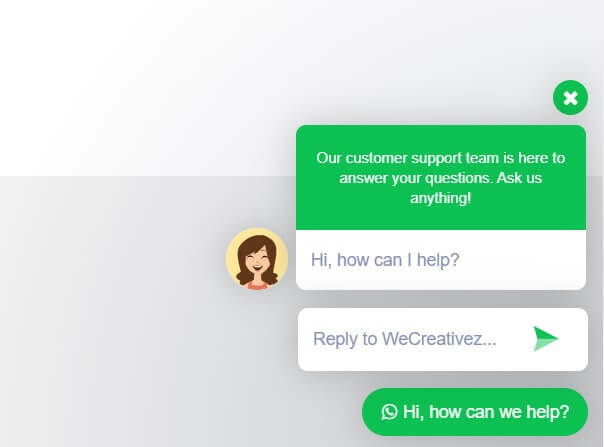 Instead of filling a contact form or pop-up form, it will be great if you can provide simple customer support or live chat support. WhatsApp is a huge social network which got over 300million+ users a day. Everybody likes to get things inside it. So, using a WhatsApp chat plugin will be a good idea as a business owner. So without wasting time, let’s get into the list! WhatsApp Chat WP is a freemium WordPress plugin. The plugin is created by QuadLayers, the same developer who created the famous plugin QuadMenu – the WordPress mega menu plugin. At this time of writing, there are more than 30,000 active installations are available. The team is adding new features on every new update and making the plugin feature rich! For more advanced features, you may want to consider purchasing their premium WhatsApp chat plugin. This can be done from QuadLayers. For support and assistance, you can create a support ticket, post on the plugin’s support forum or need to contact them on their Facebook page. WordPress WhatsApp Support is a premium WordPress plugin which can be downloaded from CodeCanyon. For a regular plugin license, you just need to spend $15. At this time, they are not offering a developer license for clients. This plugin is highly customizable and comes with pre-made templates. On top of that, you will be able to create custom templates from scratch. This is a multilingual plugin. There are more than 10 languages are available. So, no matter which country you live in or which country you target through your business. The plugin got you covered! WP WhatsApp Button is another premium plugin for WordPress. For this plugin, you just need to spend $10! Yes! $10 for a regular license. They are selling the themes through Codecanyon marketplace. The customization is pretty simple. There are 8 different positions are available. You could place the chat box anywhere you want. Thankfully, this plugin will work with almost all WordPress themes. On top of that, you can show a chat box using shortcodes. This makes the embedding easy as a pie. Let’s say you need to add a chat box in any of your widget areas. Simply add a text widget to your widget area and paste the shortcode. WhatsApp Contact Chat is another premium WordPress plugin which is selling through the CodeCanyon marketplace. Pricing of this plugin is $17 for a regular license and $67 for an extended license. There are pre-made templates are available which will help you to get started quickly. Also, the plugin settings are pretty simple and every beginner can do it. You can add multiple WhatsApp accounts to the plugin settings. You have got complete control over the chat box. Without adding additional CSS, you can style the button and box. In some mouse clicks. 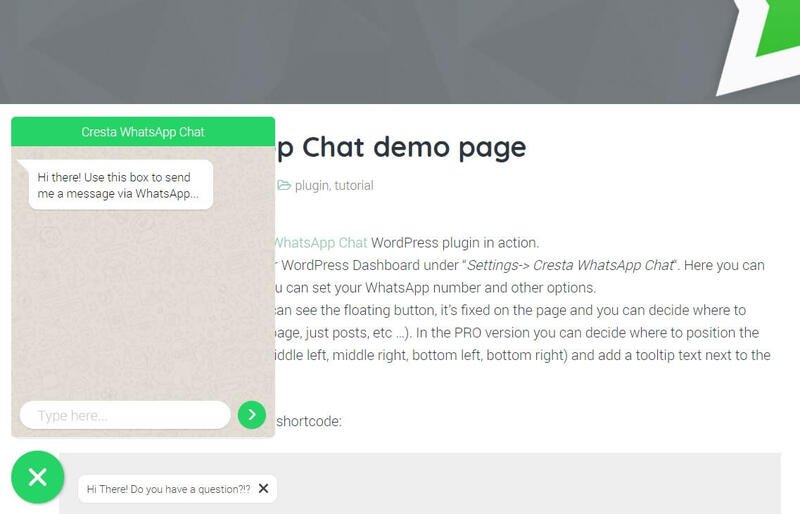 WhatsApp Click to Chat is a premium WordPress plugin. Price of this plugin is $19 for a regular license and $70 for an extended license. You can set support hours according to time and day and also you can set multiple WhatsApp accounts. Also, you can show the box according to the user’s scroll length, inactivity etc… Shortcode option is also available. WhatsApp Contact Button is developed by the folks from web-cude. They just released an updated version of the plugin in the marketplace and making the plugin famous. The theme will also work with all WordPress themes. The plugin got also shortcode support and 8 animation effects to choose. The button style and pop-up window are customizable. Social Tabs Live Chat for WordPress is not a dedicated plugin for WhatsApp chat. By using this, we will be able to implement Skype, WhatsApp, Facebook, Viber or SMS chat. The price of this plugin is $21. For the extended license, you may want to spend $75. There is no setup required. You will get an unlimited history of chat. Also, you will get unlimited bandwidth! Cresta WhatsApp Chat is a free WordPress plugin which can be downloaded from the WordPress plugin repository. Currently, there are more than 3000 active installations. Using shortcode, you can display the WhatsApp chat box. The free version plugin got some limits. There’s also a premium version plugin is available with some advanced features. If you are a complete beginner, we recommend you check out the WhatsApp Chat WP plugin. It’s compatible with the latest version of WordPress and I am pretty sure that you will love it! When you think you need more powerful features, you could also upgrade to the pro version plugin: WhatsApp Chat Box. Anyway, it is totally up to you now. 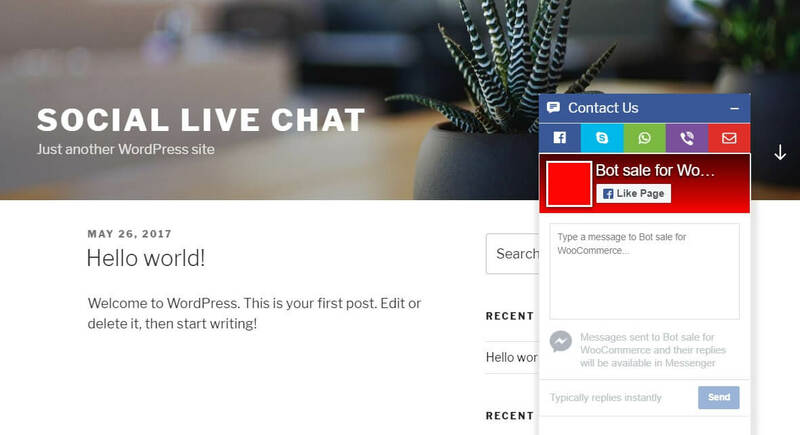 When you need to generate leads from your website, you could consider any of these best WhatsApp chat plugins on your WordPress blog. Let us know how it goes. So these are the famous and well-coded best WhatsApp chat plugins for WordPress. We hope you found this post helpful and enjoyed the read. If you did, please consider sharing this post with your friends and fellow bloggers on social media. For more related posts, you could check out the best lead generation plugins!